Set against the bleak backdrop of Northern Iceland, 1829, Agnes' story begins – and what a remarkable story it is. Hannah Kent's meticulously researched debut delves into the past, unearthing a bitter tale of heartbreak, beauty and one extraordinary woman. MY THOUGHTS: Burial Rites is a tale of such divine beauty – unforgettable in all aspects – to the point it's difficult to talk about Agnes' story without including this quotation from the book itself: “It’s written so deeply upon my mind I can almost taste the ink.” Kent's writing is evocative, leaving an indelible mark upon its readers: Burial Rites can't and won't be easily forgotten. Yet Burial Rites is not a new tale; Agnes is not a character from Kent's mind but rather a figure from years upon years before. It takes an extraordinary being to revive a tale in such a way – to breathe life into men and women long forgotten. 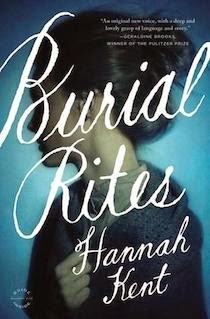 And Hannah Kent is such a being: Burial Rites marks the arrival of a new author to watch. Perhaps the most exciting aspect of this debut is just that: it's a debut. One can't help but ask: what else has this author got planned? The genius of Burial Rites lies within the complexity of the characters: first and foremost, we have Agnes' narrative, her voice a haunting whisper laced with lyrical language; then comes Tóti, his mission with absolving Agnes, both fascinating and powerful; and last, we have the family tasked with looking after Agnes, their chapters becoming increasingly more gripping as the novel progresses. The dynamic relationships between these characters are well-crafted and, if you're interested in looking further into the character's pasts, Hannah Kent's "Discovering Agnes" (which comes after the epilogue) is a must-read. Whilst, to begin with, Burial Rites is slow-paced, the second half is beyond gripping. I can't remember the last time I read a novel which so carefully combines sophisticated prose with exhilarating twists and turns. One of the best Scandinavian crime novels I've ever read. Within Burial Rites Hannah Kent has crafted an evocative tale that enthrals the reader to no end. You will be completely and utterly gripped by Agnes' tale. Believe me when I say it's strangely powerful. I did not know you read a lot of Scandinavian crime books :). The quotes you picked were lyrical and poetic as usual! I just bought this for my kindle thanks to this review! I know this sounds quite different, but have you read The Girl With the Dragon Tattoo (also a Scandinavian crime novel)? It's my all time favourite book! Yes! I totally need to read more books set there now! Crime novels are a bit out of my comfort zone. Actually, they are way out of my comfort zone. But I think what has piqued my interest the most about this book is that it is set in Northern Iceland (Southern Iceland would have been just fine too). I don't think I've ever read a book or known about a book that took place in Iceland, and this has made me especially curious about this book...!!! It's not hugely focussed on the crime, it just focusses heavily on the life of the murderess. In fact, it's a hugely character-centric book. Very different to many crime novels out there. And I agree, there aren't enough books set in Iceland!